Welcome Friends! I want to give a quick shout out to everyone who left their congratulations to our big news! Thank you! My posting frequency might take a little bit of a hit, but I still have some fun stuff planned in the next few months. It just might take me longer to get it all together than it normally would. So, please stick around! I had to share this one from Taidye Designs. I’m glad I’m not the only one that think of romance this way. I’m corny and lame when it comes to romance (don’t believe me, check out the ABC’s of Love series) and My Mr. Right always indulges me and plays along. Check out this oopsy-turned-fabulous over at Newlyweds on a Budget. Kari took a project she tried (but didn’t like the end result… don’t you hate when that happens?!) and turned it in to this too cute canvas. What a great way to make the best of a not-so-great project (although, for the record, I thought the original project was cute too). P.S. Kari, I LOVE the texture! 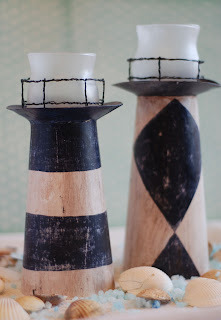 You’ll never guess what these ADORABLE votive displays are made out of! Seriously. Head over to Burton Avenue and check it out. These are amazing! The beach is my happy place. It just amazes me how beaches are so different, yet it’s just sand and water. I don’t know if it’s the soothing sound of the waves or what, but I always feel so peaceful at the beach. 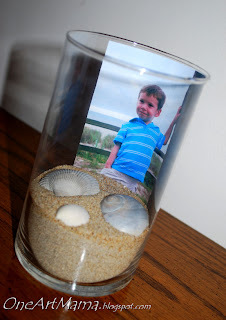 One Artsy Mama shares some incredibly cool ways to get a little of the beach right at home, even when you’re totally landlocked (like me). I wish I had time to feature more, there were so many cool things linked up last week! If you didn’t get to check it out, I highly suggest you check it out. Thanks for sharing, if you were featured, feel free to grab a featured button from the side bar. And for this week… You know the rules. Family friendly links only and no commercial sites, please. Also, stick around and mingle a little. Check out some of the other cool stuff. Don’t be a wallflower! It’s a party! thanks so very much for featuring my printable!